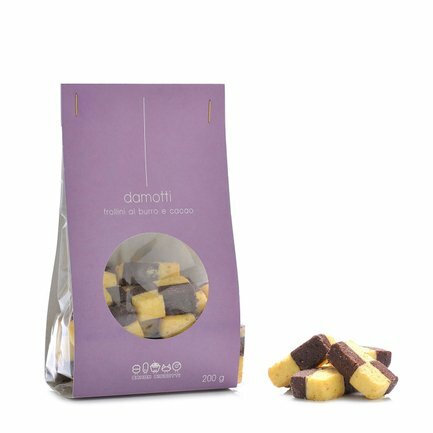 Damotti are butter and cocoa shortbread biscuits devised by the creative fantasy of Banda Biscotti, an organization created to support and provide vocational training for several of the inmates of the prisons of Verbania and Saluzzo. Prepared meticulously with selected ingredients, these biscuits speak to the dedication and desire to improve of the people who make them day after day. More than a mere sweet distraction, these biscuits are for people who want to enjoy a tasty delicacy while helping others. Try them with afternoon tea or dip them in milk for a tasty breakfast. Ingredients Wheat flour, butter 25%, sugar, fresh pasteurised eggs, cocoa powder 2%, vanilla essence. ALLERGENS: Cereals containing gluten; Eggs and derived products; Milk an derived product; traces of nuts - almonds, hazelnuts, walnuts, cashew nuts, pecan nuts, Braz For more information on product labels, please contact our Customer Service department. The information on the labels of the products may vary for reasons beyond our control, therefore, there may be discrepancies between the information on the site and that on the products delivered. Please always check the information on the product before consumption or use.